This is the last post in continuation to my last two posts about our visit to Hisar to meet our “childhood”. We ( I and my sister, Neena ) had visited different houses which were home to us and two schools, where we studied up to our matriculation. We could also meet few old friends who are still living in the “steel city of India”, Hisar. We came to this house when my father took charge of “Wool Grading Center” as it’s director. This was the residence allotted to him by the Government of Haryana. It was a majestic old property and we all loved it. A very huge bunglow , built in 18th century, the building is constructed of burnt mud and clay bricks and mortar made of lime, sand, and surkhi. Surkhi is made by grinding to powder burnt bricks or burnt clay, used as a substitute for sand for concrete and mortar, has almost the same function as of sand but it also imparts some strength and hydraulicity. A Part of it was much damaged and though it was part of the residence, it was only used as store as there were already enough rooms for four of us. This extra room was used as a store. A new kitchen and modern toilet complex was added to the premises to make it suitable for residential use by the public works department. It was divided in two sections and were allotted to two senior government officials of Haryana Veterinary Department . Hooda uncle , papa’s colleague and his family was our neighbour who were staying in the other half of the exalted kothi. There were very large open spaces in front of it. A brick lined and somewhat kachcha road used to connect us to the main road known as Thandi Sadak. One could see this majestic kothi right from the main road in good old days, when we were staying there. Now, it,s not visible at all, thanks to encroachment by land sharks and no action taken by local administration. This building was handed over to Archaeological survey of India in 2006 to develop it as a museum. The government has spent almost 50 lakhs in its restoration. With a view to educate and acquaint the general Public with the heritage of the region, this small museum was set up in the Jahaj Kothi, a monument of British Period. It displays the antiquities of popular Harappan sites like Banawali, Kunal, Rakhigarhi etc excavated by Department of Archaeology in Haryana. George Thomas, a native of Ireland and the uncrowned ruler of the territory between Sirsa and Rohtak built this building as his residence. Owing to its isolated location, it gives an impression of a ship in the ocean surrounded by a huge open area. A progressive distortion of the word ‘George’ to Jahaj over a period of time brought a new name to the place. After the defeat of George somewhere in the first decade of 19th century, James Skinner, a respected name in the service of British Government, became the ruler of this territory. He also used ‘Jahaj Kothi’ for some time as his residence before constructing his own palace at Hansi. This monument is a good example of pre-British architecture in the transitory phase. We visited this place on Monday, 16th July, 2018. Mondays are usually holidays for museums. But the care taker was considerate enough to open the doors of museum to us. In his own words – “This is for public and since I am here, I will show it to you. Not many people come to visit this place but I am happy you people have come to see the museum.” A rare breed of committed government employees. 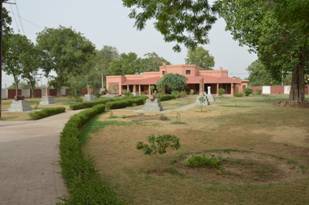 The museum is very well maintained and has lots of excavated articles and carvings from different places in Haryana. It has the artifacts excavated from Panipat, Agroha, Hisar and other places in Haryana. Most of them were dated back from 9th century. Interesting and relevant details about the displayed articles were prominently placed. It’s a must visit place , if you happen to visit Hisar. This fireplace was in our drawing room. This was the master bedroom of our house, my parents room . In those days, my parents’ bed was placed where this large terracotta pot stands proudly today. The fireplace was our temple. We had a routine of singing “aarti” before having dinner. It was a routine, we followed every day for years. This room below was our drawing – dining room. I was in love with these old styled doors and windows. It was very overwhelming to see the transformation of this majestic old property which was our home into marvelous museum depicting history of our home state Haryana. Our family has also become part of this elite history!! Many grand and impressive excavated articles like pillars and murals were placed in the garden developed around the museum, in the small plot which has overlooking illegal buildings and windows . The entry to the museum is pathetic and there is no space for parking too. The board itself looks very sad , dull and uninviting. As per the report from a news paper, land worth crores have been encroached. Illegal buildings all around have mushroomed and one can see annoying windows openings from the museum. We remember the good old days when this majestic kothi can be seen from the main road with open grounds all around . On weekends and other public holidays, tens of cricket teams of children could find place to have their matches. We spent quiet some time here and left again to our present life, after meeting our “childhood” in the “steel city of India”. Unfortunately, I have deleted some very interesting photographs inadvertently , which I would have shared here to have a better view. रेत का समन्दर हो चली थी!